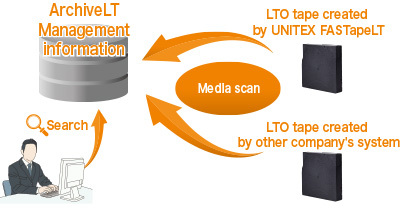 UNITEX ArchiveLT enables high speed data archive to make the maximum use of device’s performance by UNITEX unique data transfer algorithm. It enables high speed data archive to not only LTO drive but also various disk storage such as HDD, SDD, and Optical Disk Archive*. 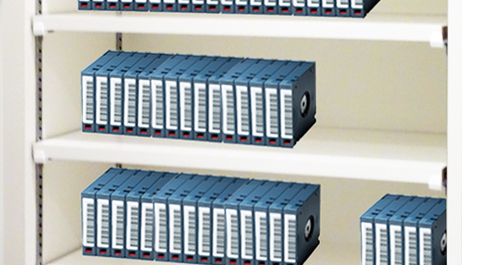 In addition, UNITEX ArchiveLT has many functions for handling important data safely such as simultaneous archiving to multiple devices, automatic verification after archiving, encryption of LTO tapes, etc. * An Optional license is required when you use Optical Disk Archive. Data archived by UNITEX ArchiveLT is registered in the management information, and it can be searched off-line. You can check the contents of data and search your target data in less effort. And you can register up to 15 any metadata for each archived data. For example, you can easily make shelf management for lots of LTO cartridges by registering the location of LTO cartridge and data’s information in metadata. The job execution result for the important data asset is stored automatically. And you can check it in Job History Management window. * Enables to output them as a report file as well. When data is archived in UNITEX ArchiveLT, hash value of each file is automatically registered in management information. Consistency check function enables to confirm that there is no change in the archive data by recalculating the hash value and comparing with the hash value in management information. You can add media information created by UNITEX FASTapeLT or other company’s software to ArchiveLT media management information by scanning it. 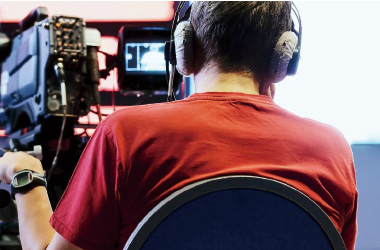 With this function, you can import media created by other software and manage it off-line. You can schedule and archive data automatically such as "Everyday at 6 o'clock", "Every Friday". Periodical data backup etc. can be done only with the first job registration operation. * An optional license is required to use the schedule function. Enables to watch the folders and archive them automatically when the capacity exceeds the set value. Also enables to start archiving automatically when the number of files exceeds and when the specified filename is detected. You can save disk space and reduce costs by archiving the increasing data such as shooting data of surveillance camera to LTO tape. * An optional license is required to use the watch folder function. Supports various system according to the use from the entry configuration using a laptop PC to the mid range configuration supporting a tape library. * An optional license is required. Capacity of the video data is increasing to 4K/8K. And there are a variety of target management files such as video footage, project, metadata file, etc. in the video data. How to store and manage them, including other digital assets, is a challenge. UNITEX ArchiveLT solves it by data storage & management function in LTO that is reliable and cost effective. Data archived by UNITEX ArchiveLT is registered in management information. And LTO assets stored in the past and LTO created by other software/system can be registered in management information and can be managed off-line collectively. By using the off-line management function, you can easily search which data is stored and where it is stored without taking LTO out of the shelf, and you will be able to make effective use of information assets. 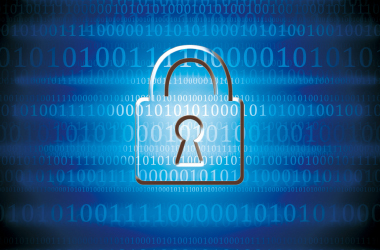 By archiving your important data to LTO and managing it off-line, you can minimize the security damage caused by Malware such as Ransomware. And UNITEX ArchiveLT enables you to retrieve the archived data easily whenever it is required. * Please contact us for OS not listed. *2 An optional license is required.